This statement doesn’t bode well for the future of Adelaide United – having enjoyed a fine start to the season, a prolonged slump in form and a rumoured breakdown in communication between the coach and the board has led to the shock resignation of Kosmina, a popular figure at the club, despite firmly playing a role in the side’s slide down the table. Initially, Kosmina wanted his side to play a positive, high-tempo possession game, but they played largely on the counter-attack in their pre-season Asian Champions League commitments. This was befitting of the style on the continent – as Brisbane’s contrasting failures emphasised – and they carried this promising brand of football into the opening rounds of the A-League season. The contrast of their supreme organisation with opposing sides attempting to play open (and at times suicidal) football, combined with their superior fitness levels, saw them surge to the top of the table. In a 4-2-3-1 system anchored by the midfield presence of Osama Malik and Cameron Watson, Kosmina found the perfect balance between defensive football and winning football. But after a 2-1 defeat to Melbourne Victory, Kosmina bemoaned the fact his side lacked a ‘cutting edge,’ and from that point onwards, encouraged his side to play higher up the pitch, and become braver in their use of the ball. Significantly, he removed one of his deeper midfielders in favour of an extra attacker – the Argentine Marcelo Carrusca – and switched to a broad 4-1-4-1 system. It is this that has, more than anything else, defined Adelaide’s season. From an optimistic point of view, Kosmina’s desire to squeeze in so many creative talents is admirable and has led to some breathtaking football, and brought the best out of Dario Vidosic, who currently leads the club charts in both goals (8) and assists (5). When they play with fluidity and rotation in midfield– with one player dropping in, another dragging away a marker – the speed of their ball movement can be almost impossible for opponents to deal with, with Carrusca’s awareness of space particularly important to bringing the ball high up the pitch. In his recent absence, however, the Adelaide attackers often play in a distinct ‘line of five’, with no link between midfield and defence. A lone holder – originally Malik but now Watson – is forced to become that link, as well as protect the back four, often to disastrous effect. 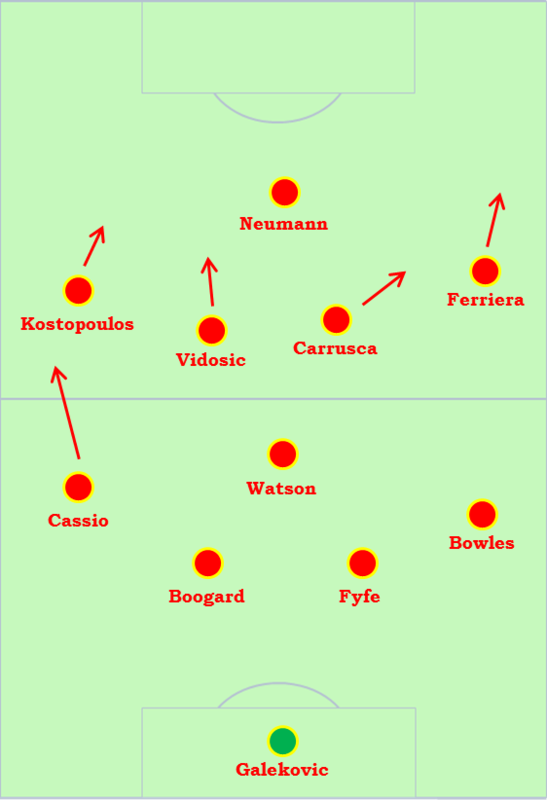 It’s become far too easy for sides to overload that deep midfielder – Sydney did so with clever fluidity between Alessandro Del Piero and Terry Antonis, the Wanderers brought the wide players inside to create 3v1 overloads in the centre to devastating effect, while Brisbane used Mitch Nicholls in an advanced midfield role, where he created a fine winner. Either Bruce Djite or Jeronimo Neumann leads the line. Both offer obvious differing characteristics: the former offers more classic hold-up play with his strong physique and works hard to win the ball, while the Argentine plays on the shoulder, offering runs behind the defence, but is also capable of drifting into space to link up with the attacking midfielders. Dario Vidosic and Carrusca, Kosmina’s preferred pair of central attackers, focus on creating chances, but in the lack of a truly prolific centre-forward (something which hasn’t been helped by Jeronimo’s limited availability), the onus has been on Vidosic to break forward and provide goals, and he’s particularly good at timing runs for cut-backs from the byline. Carrusca is a more cerebral playmaker and operates in deeper zones, and likes to drift towards the right flank to link up with the winger. Kosmina, in a brief attempt to solve the midfield dilemma, experimented with Carrusca in a deeper role, to limited effect. On the flanks, Kosmina prefers pace and directness, and chooses two of Evan Kostopoulos, Iain Ramsay and Fabio Ferriera – the Portuguese has emerged as an exciting talent, threatening with his dribbling and delivery from wide areas. Jeronimo is also an option on the left, and drifts inside and plays narrower, almost as an extra midfielder, while Jake Barker-Daish is also an option either out wide or through the middle. With injuries plaguing the squad, Fabian Barbiero has enjoyed a run of games in the side, and unusually, despite nominally being a sitting midfielder, has also played high up the pitch, which doesn’t help fix the lack of a link between defence and attack – although in fairness, he played closer to Watson in the 3-1 defeat to Central Coast. Kosmina obviously wants his side to push back the opposition defence by pressing, but it’s too easy for a centre-back to pick out a pass between the lines. Kosmina recently complained about a ‘lack of options’ – and in light of recent news, these decisions might take on more significance – but the decision to release Zenon Caravella and Sergio van Djik on free transfers seems bizarre if you think your squad is light on personnel. Of course, extenuating factors apply, but both would have been useful to provide experience in attack. Behind these attacking options is a hard working ‘water carrier’ –Malik was hugely impressive in that role and was on the fringes of Holger Oseick’s squad for the East Asian Cup, but he’s apparently been made the fall guy for Adelaide’s dip in form, and been replaced by the versatile Watson, who covered for the injured Daniel Bowles at right-back for the first half of the season (and briefly played there under Rini Coolen), but is clearly not a regular in that position. Bowles is a far more natural defender – although his passing leaves a bit to be desired – and scampers up and down the touchline to good effect. On the opposite side, Cassio readily motors forward on the overlap, but his attacking contribution varies between games, as Ramsay likes to stay wide, which limits the space available for the Brazilian. In the centre, there are four options: Jon McKain, Nigel Boogaard, Anthony Golec and Iain Fyfe – the latter is the most limited technically and was poor against the Heart, but positions himself well. He has a good partnership with Boogard, who appears to be first choice, despite being prone to lapses in concentration. That makes sense if McKain is used in midfield, which is where he played in his late cameo against the Mariners. Golec shouldn’t be underrated either – his partnership with Boogaard was the key to a good run of clean sheets at the start of the season. Fortunately, in spite of this instability at the back and the aforementioned problems with the overall structure, Eugene Galekovic is an outstanding goalkeeper and a tremendous shot-stopper. If Adelaide had played with this 4-1-4-1 system from the opening game, they wouldn’t be anywhere near the top of the table. As it is, apart from some sporadic wins, they’ve experienced a prolonged slump in form and certainly don’t look like title contenders. It’s a shame, for this is a young and exciting team, but at the end of the day, a naïve commitment to attack and lack of balance will always undermine a side. That, coupled with the shock news of Kosmina’s resignation, leaves much work to be done for his successor, Michael Valkanis. This is an unbalanced squad – the former assistant must strike the right note between attack and defence. In the meantime…”I was digging in the back garden when Griffin rang me a year ago,” says Kosmina. Adelaide fans are certainly no strangers to controversy and turmoil. Once again we find ourselves embroiled in an upheaval at the club following the departure of John Kosmina. Kossie, our own ‘prodigal son,’ was thought by many Reds supporters to have restored pride in the shirt and brought stability to the team following the depressing run of results under Rini Coolen. Another strong AFC Champions League campaign followed by two solid wins to begin the A-League season suggested we were indeed reborn under Kosmina. However, following our encouraging start, both performances and results have been inconsistent; Kossie’s aggressive but reckless strategy produced football that both excited and frustrated Reds fans. Despite sitting 4th on the table and having held a spot in the top 2 until the previous round, the challenge for Kosmina’s successor is to create actual on-field stability rather than merely the perception of it, knowing that the passionate Hindmarsh crowds will not be satisfied by anything less than challenging for the title.